When I was in high school, my parents had a sweet minivan. And I hated driving it. That thing was massive! So, you can imagine my ambivalence about learning to captain a 46-FOOT-LONG BOAT. That’s like three Dodge Grand Caravans. Brian and I were really excited about taking the boat out for cruises around the bay and eventually trips down the California coast. But, we also knew that we had a lot to learn, first. So, in the interest of safety, we hired a real-life captain to teach us a few things. And I’m so glad we did. In just four, four-hour lessons, I went from plebe to captain (Brian has more boating experience so he started out as a lead deckhand). Here’s what we learned from our buddy, Captain John. During our first lesson, we didn’t leave the slip. This one was all about getting to know the boat, where all our safety equipment is located, what all the stuff in the engine room does and what to do if the Coast Guard decided to board us (which they can for any reason at any time – unless we’re docked our anchored). After four hours of checklists and lectures, I was exhausted. But I learned a lot. Here's all the stuff we do before we get underway. Every. Time. Our inspections usually take about a half hour. This was when the fun started. Captain John (mercifully) took us out of the harbor, and once we were clear of the tricky navigational stuff, we got to play with the engine thrusters. 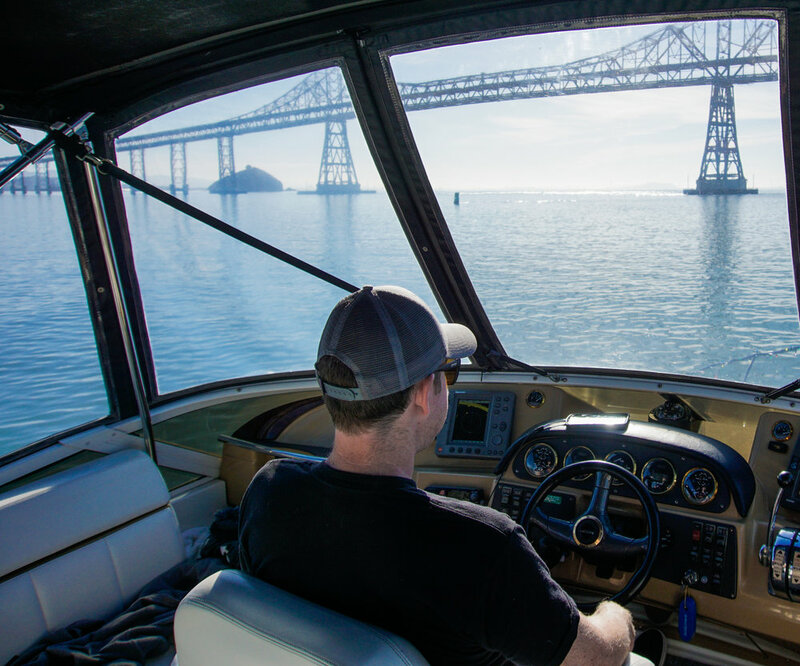 We don’t use the boat’s steering wheel when we’re in a no wake zone because it’s not very responsive at slow speeds. Instead, we rely on the engine thrusters. The Cataline Wine Mixer has two engines, and each thruster controls one side. It makes maneuvering the boat surprisingly easy, once you get the hang of it. Captain John had us running endless “station keeping” drills, which basically means using the thrusters to stay put. The wind and currents push the boat around, so this can be more challenging than it sounds! The slip where we keep our boat docked is NARROW, so there isn’t a lot of room for error. I was super nervous about learning how to pull the boat in and out. But, after our last lesson, I was feeling way more comfortable with the engine thrusters. So, there was nothing left to do but try. Backing the boat our of our slip is pretty straightforward. I totally nailed that part. But coming in to dock is way more complicated – especially if the tide is strong. We have to get perpendicular to the slip, turn the boat on a dime and then cruise into the slip. Which sounds easy enough. But, the wind and current can easily throw us off course. Captain John was incredibly patient. Things got a little dicey a few times, but he was calm as can be, and we got through it! My biggest takeaway was that we should take our time when we dock the boat – if we get pushed off course, we’ll just start over again. No biggie. It's a tight squeeze! But we got the hang of it. By now, we felt pretty comfortable pulling in and out of our slip and steering the boat. We’d logged about eight hours on the bay and had practiced navigating our harbor more times than I could count. But Captain John wanted to be sure that we could handle ourselves in an emergency (specifically if a person – or worse, Indy – went overboard) so we headed out to practice some man overboard drills. Captain John would throw a flotational device overboard, and Brian and I took turns being the captain and the rescuer. It’s a little crazy because if someone falls overboard, we have to turn around and drive straight at them (which I imagine would be a little scary! ), cut the engines when we get close, and wait for the current to push them along the side of the boat where we can grab them. I really, really hope we never have to do this in real life, but it does feel good to know that we are capable of pulling off a smooth rescue. Captain Brian is cool as a cucumber. And just like that, we’d completed our initial training! We’ll probably schedule another lesson with our pal Captain John before we head out to Monterey in a couple of months. But since our last lesson, we’ve taken the boat out dozens of times, and I can’t believe how comfortable we are with it. Driving this thing is actually pretty fun. So, if you spot The Catalina Wine Mixer out on the water, don’t get scared. We totally know what we’re doing. ...and for the record, I'd much rather dock this boat than park that minivan!